It's not the prettiest watch out there, but Tizen OS offers some neat tricks that Android Wear currently doesn't. Samsung’s been pretty quiet on the wearables front, but for good reason. It was hunkered away in a South Korean bunker somewhere reimagining what its smartwatch should look like. The result is the Gear S2. It’s round, it rotates, and most importantly, it does not run Android Wear. So, what’s the point? Should you even consider a smartwatch if it doesn’t run Google’s version of its wearable software? Yes, you should. Because although the current crop of smartwatches are much more stylish to wear, the Gear S2 at least offers a different watch experience. Google could actually learn a thing or two from Samsung here, though I never thought I’d ever be typing that sentence. The Gear S2 classic is the style I gravitated towards the most. Samsung heard how you all cooed over the round Moto 360 at last year’s Google I/O keynote, so it rounded its own. The Gear S2 comes in two styles: a regular version with a sporty, integrated plastic band, and a classic version with a removable leather band. Unlike the other smartwatches I’ve seen in Berlin, these weren’t bands I’d consider wearing myself. Samsung made sure to mention how many band sizes are offered, but this is one time I was actually hoping to be pandered to. I am a woman, and I like when companies remember I exist. The Gear S2 is still too masculine for me, though at least it isn’t as huge as Samsung’s first-generation wearables. The Gear S2 employs two navigation buttons: a back button and a home button. I wasn’t as keen on the regular, slightly larger Gear S2. It looked too masculine. Looks aside, the actual execution of the Gear S2 is impressive. It has a back and home button on the right side, which I’m okay with because Android Wear’s gestures are sometimes confusing to use. Second, the bezel around the Gear S2 actually rotates, so you can use that to scroll through the interface. It can seem a bit gimmicky at first, but I commend Samsung’s attempt to try something new here. Touching a screen is nice and easy, but it’s fun to have that physical feedback, too. You can scroll through the Gear S2’s Tizen interface. I found the classic variant of the Gear S2 to be the most comfortable of the two Samsung smartwatches. The leather band is flexible and feels like I would break it in over time. The regular plastic Gear S2 is too rigid and you can only buy proprietary watchbands to fit it. Yes, Tizen uses Samsung’s S Voice, which is a bummer, though it redeems itself in other ways. I’m conflicted about Tizen OS. In the past I’ve been sort of reluctant about its existence alongside Android, as if Samsung was attempting to eclipse all the work Google had done and branch off on its own. That’s not the case here, however. Samsung actually made the Gear S2 compatible with any Android smartphone running KitKat and above. Not all of the notifications and Gear S2 features will work on every phone, but at the very least you have the choice to buy a Samsung smartwatch and keep your non-Samsung phone as your daily driver. The Tizen watch interface is so much easier to get a hang of than Android Wear. Sure, Android Wear got easier to use after the update last April, but Tizen offers some fluidity that Google’s wearable interface doesn’t. The application launcher circles around the interface, so I can easily choose the app I want by rotating or tapping. When it launches, it’s live, and when I want to get out of it, I just hit the back button. I need this sort of tactile feedback in a wearable interface because that’s how I’m used to using my phone, and I like that Samsung translated it from its phones to its watch. Ease of use doesn’t necessarily mean minimalistic; it means it should be intuitive, which Tizen’s wearable OS is—surprisingly! Tizen OS also offers some of the same goodies as Android Wear, including standalone Wi-Fi support, which doesn’t require a phone to configure, and widgets. By default, the Gear S2 displays six widgets on screen, though you can add up to 12. You can cycle through them on the Home screen of sorts with the scroll wheel or with your finger. Samsung also enabled standalone 3G support and NFC capabilities, so you can tell your mom you’re out on a run and then grab a Gatorade on your slow walk home. I’m simply not feeling most of these watch band choices. In a perfect world, I could have the functionality of the Gear S2 coupled with the style of Motorola or Asus’ new smartwatches. Samsung’s new smartwatches offer some nice-looking bands, but I’d probably pair them with my fiancé’s hipster-man wardrobe instead of my own. Not even a perfectly pressed women’s J.Crew shirt would go with the stainless steel style of the Gear S2. It just isn’t happening. Regardless, there’s a lot to learn from Samsung here. The Tizen wearable interface is a breath of fresh air from all the other copycat Android Wear devices out there. Android Wear is boring to use, while Tizen is fun! I’m not worried about app availability, either, because Samsung is a big name in the industry and, frankly, Tizen had an Uber app before Android Wear. 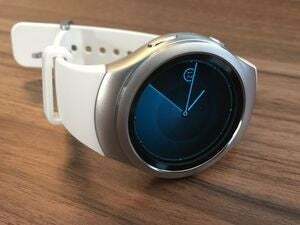 While it’s not the most feminine smartwatch for a style conscious lady like myself, the Gear S2 is going to bring some real competition to the Android wearables scene. I’m curious to see how well it will pair with other smartphones, and how it performs out in the wild. At the very least, Samsung’s thrown a wrench into an otherwise static wearables scene.